In this installment of the series, we’ll hear from three pitchers — Bud Black, Zach Davies, and Robbie Ray — on how they learned and developed their curveballs. “In the early 1980s, I was with the Royals in West Palm Beach. It was spring training, and Tom House was writing a book. He wanted to highlight my curveball. There were guys he highlighted on the fastball; there were guys he highlighted on the slider. I was one of the guys he highlighted on the curveball. Because he thought that I had a good one … that heightened my awareness of how I threw it. It kind of threw me back to my youth, and what I was taught about a proper curveball. The true curveball, with overspin, 12-6. The old-school drop. “When I was around 11 years old, I was at a baseball clinic in southwest Washington. There was a coach — I can’t remember his name — who spoke about the importance of your middle finger on a seam, and developing that true overspin. Just like a fastball should have true backspin, a curveball should have true overspin. “I was young when I first started leaning a curveball. I was probably only 10 or 11, but I did all of these drills to make sure that I threw it right. Growing up, I would take a water bottle, fill it up with a few rocks in the back yard, and try to flip it end over end. That was to try to make sure my mechanics were right, to make sure I spun the ball right, to make sure I stayed healthy. 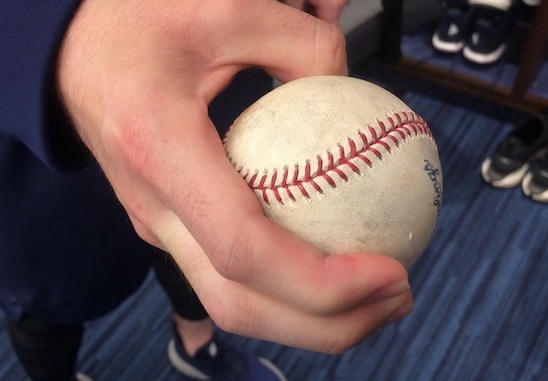 Zach Davies’ old curveball grip. “Development-wise, it’s been my most-focused-on pitch lately. It’s a pitch I’ve been able to improve, and see results with. The [improvements] have come via a mixture of grips and being able to finish off in my mechanics. The grip is a little bit different than it was in the past. It’s not so deep in the hand. It’s a little more fingers, making it easier for me to spin the ball. That, and focusing on finishing out in front, not trying to throw it up-to-down, as opposed to just firm fingers to the dirt. 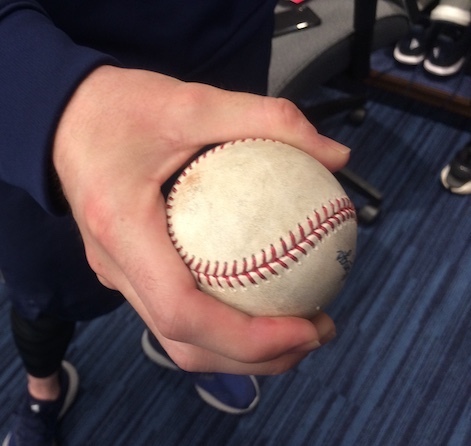 Zach Davies’ new curveball grip. “My curveball used to be this big 12-6 looper. Now it’s kind of turned into a little bit of a power curve. Coming up through the minor leagues, I wasn’t what you’d call power pitcher. I was 88-91 [mph] and would touch 92. Good changeup. This big, looping curveball. “As I started getting bigger, growing into my frame, the velo started to come and my curveball started getting tighter. Slowly, year by year, it started becoming more of a power curve to where I could throw it 85-86. “I messed around with a lot of grips. I went with a traditional curve, then flipped around the baseball, on the horseshoe. Eventually I ended up … I throw a spiked curve now. That started around two or three years ago. It took me a little bit to get comfortable with it. I worked on it a lot in spring training , and while I used it from the beginning of that season, it might not have been exactly what it is now. 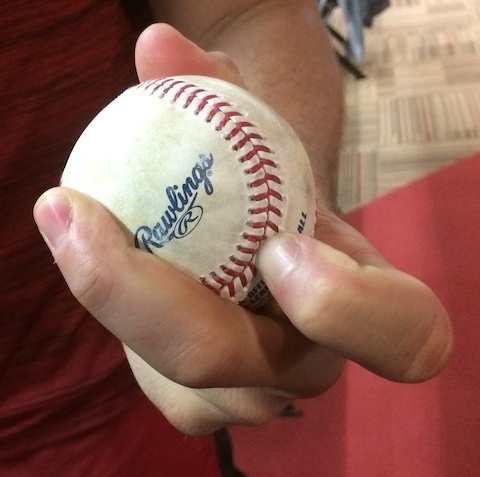 Robbie Ray’s spike curveball grip. “I liked the way it felt coming out of my hand. With the spiked grip, all of the pressure was coming off the middle finger, whereas with a traditional grip you have the index finger on there as well. I feel like that kind of takes some of the speed off of it; it slows it down a little more. This way I’m just kind of ripping with the middle finger, while my pointer finger is there to … I wouldn’t say ‘guide it.’ It’s more that it’s just kind of resting on the ball. We hoped you liked reading Bud Black, Zach Davies, and Robbie Ray on Developing Their Curveballs by David Laurila!